Saturday at the 2017 EWS International presented by Infinity and Sweep has concluded, and in the premier modified class, it was a different driver setting the pace in every round, highlighting just how close the racing is. 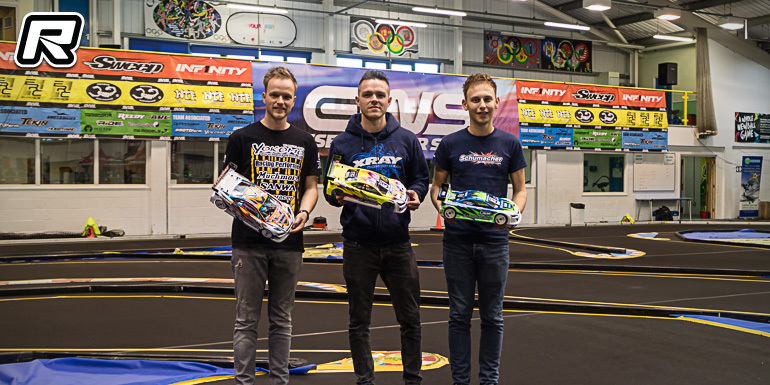 After Olly Jefferies had topped the opening round for Xray, Christopher Krapp moved Yokomo to the top of the scoreboard, setting the pace in Q2. The German driver, a veteran of this event having attended the previous three editions when it was known as the ICC, said “finally! It feels so good to have finally TQ’d a round at Essex!”, noting that whilst he had been in contention in all of his previous visits, he had never scored that elusive ‘zero points’. Noting a change to a softer rear diff fluid was the most notable change to his BD8, he also switched back to his single colour practice bodyshell. Despite both this and his race coloured Protoform LTC-Rs being mounted the same, the plain colour felt better for him. In Q2, it was Ronald Völker again second quickest, the current World Champion clearly enjoying the event but noting the challenge it provided, the track feeling different to other carpet tracks he has raced and tested on, with the different corner kerbs and bumpier floor causing him to re-think his setup, he said he is still “needing more rear end grip and my shorts”. The third round saw yet another manufacturer in the spotlight, as Schumacher’s Elliott Harper went fastest. The defending race winner was clearly pleased to set the fastest time, commenting “I’ve been fast in every round, but just not led on the last lap until now”. Adding that the racing is still “crazy close”, he will take a careful think tonight about what else to try tomorrow to try to take the overall pole position. Olly Jefferies remains in the hunt too, a second place in Q3 backing up his TQ from the first round sees him officially ranked at the top of the table overnight, but crucially he hast he slowest of the three current TQ times. 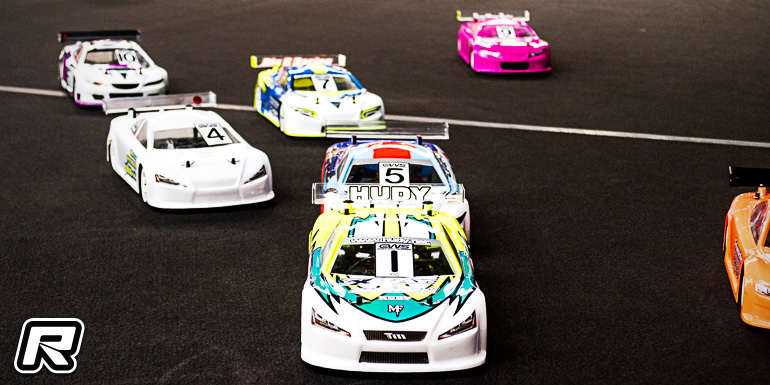 Olly pointed out “we should have just ignored today, and run a single rocket round tomorrow” – with the three TQ drivers plus Ronald Volker, who has two second place scores, all in with a chance of starting the three leg A final from pole, depending on the result of tomorrow’s final qualifier. Kyle Branson hold the title of “Mr. Consistent” at the moment, with third place in every round. Similarly to Elliott, he noted that he had led every time, but just not been at the front when the five minutes ended. To help with this, he plans to try a change tot he wheelbase setting, which he will test in the morning practice run each heat has been given. Over in the Super Stock class, Xray’s Zak Finlay dominated proceedings, topping all three rounds and giving himself a worry-free evening as he cannot now be beaten tot he overall TQ. Behind him, Max Mächler holds second with, notching up that position in every round. The German Awesomatix Team Manager, making his second trip to the event said that he “gave it 110%” to try to beat Zak, but he just couldn’t drive at that pace for the entire five minutes. Looking towards the finals, he said “that’s another story though!”. The Formula TQ was also wrapped up as Damian Giddins took his Xray to the quickest time in all three qualifiers.